Cleanse skin with an electric face brush that ditches traditional bristles in favor of better-for-skin antibacterial silicone. The brush is rechargeable and shower-safe, and vibrates to help the silicone glide over skin without causing abrasive friction. And this special silicone is imbued with Tourmaline, which produces health- and mood-boosting negative ions. Flip the brush over to experience a skin-lifting pulsating massage, too. Electric face brushes are a great way to get skin clean, but the bristles can harbor bacteria, and the heads need frequent replacing. So we were drawn to the antibacterial, silicone cleansing brushes from Nion Beauty for their bristle-free designs. They don’t use friction to clean skin, but let gentle vibrations do the job instead. All Nion Beauty’s brushes have a 45-degree sloping design that glides smoothly over skin and are made with antibacterial silicone that takes the cleaner, gentler place of traditional bristles. The silicone is imbued with Tourmaline, a natural material that produces negative ions thought to boost circulation and counteract toxins. 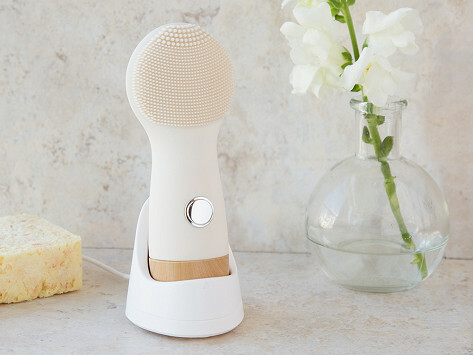 There's a brush that delivers a skin-lifting pulsating massage along with cleansing, and brushes that are rechargeable and can be used in the shower. The skin-pleasing benefits combine with beautiful design to result in cordless brushes you’ll appreciate as much as your skin will.